Tip: When cooking steak always let it rest for half the cooking time. When you cut into the meat it will hold the juices better if allowed to rest and be much tastier! Hey there food lovers! Our chefs have put together a cracking little recipe for you this month….A Grilled Flat Iron Steak with a dollop of Chimichurri Sauce. After a busy day or week this meat feast is the perfect remedy! Flat iron steak, sometimes called the top blade steak, is relatively new to the market first becoming popular in the early 2000’s. Prior to that it was generally used to create mince for hamburgers. The flat iron is very versatile, incredibly tender and flavoursome and if you have a chat with your local butcher we’re sure they’ll pick you out a nice cut! It’s a great option if you’re under a bit of time pressure mid-week, you can cook to perfection in no time at all. 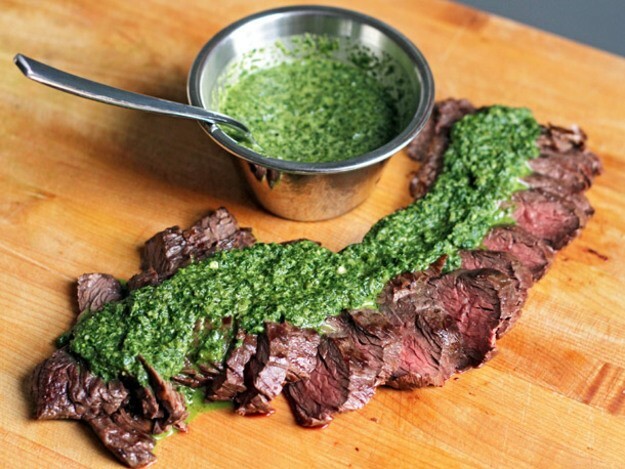 We’ve pared our flat iron steak with a Chimichurri dressing for this recipe but it works magically with a simple sprinkling of black pepper. Here’s the ingredients you’re going to need……. Preheat oven to 200C. Preheat BBQ or griddle pan to high, allow the steak to come to room temperature. Toss the sweet potato in the oil and curry powder, place on a baking tray and into the middle shelf of the oven for 30mins. Meanwhile, cook the steaks on the pan or BBQ for 5-10mins on each side depending on your chosen level of doneness. Allow to rest for half of the overall cooking time. While the steak is resting, blitz all your ingredients for the chimichurri in a food processor. Slice the steak thinly against the grain, pour the chimichurri over the top and serve with the sweet potato wedges. Best of luck with your flat iron steak, send us a message and let us know how you get on. If there’s any special dishes you have in mind you would like to see please send let our chefs know, they’d be happy to whip something up for you in the kitchen! Thanks for dropping by….Until next time!